To help us finance the annual production. To support this production, follow the link to St. Paul UMC's donation page. Put the donation amount in the "OTHER" box and put "PASSION OF CHRIST" in the comment line next to it. Until after the production this year, you can also choose the Passion of Christ line item on the site. You DO NOT need to create an account. For frequency, select "One Time", and then click "Continue". Order Shirts and Hoodies - Online ordering no longer available for 2018. We don't offer t-shirts and other items as a way to make money - we offer them as a way to get the truth of God's love to the world. Especially the travel coffee mugs this year. Online ordering of the tees and hoodies will end on February 10, however, tees will be available at events at St. Paul UMC in Lusby and elsewhere until supplies run out. We do not order extras of the special items such as hoodies or long-sleeve shirts so they can only be obtained by ordering them on the website. 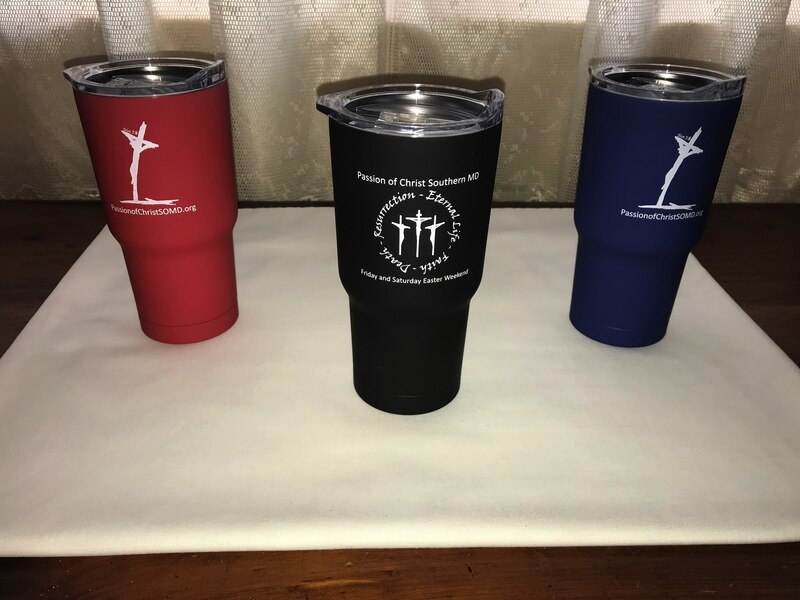 The stainless steel mugs are only available at events at St. Paul and elsewhere. They are stainless steel and come in three colors! The picture shows the front and back designs - all mugs come with both.